Dozens of world leaders will attend the Moscow celebrations to commemorate the 70th anniversary of Victory in Europe. However, others, including Russia's WWII allies, have refused to do so, citing Russia's alleged involvement in the crisis in Ukraine as justification for their absence. A boy stood at attention rendering a salute to the soldiers rehearsing their march on the Red Square on May 9. The soldiers couldn't ignore the "Little General's" salute. A number of French politicians said it was a “shame” that their president is on Washington’s leash after rejecting Russia’s invitation to attend the Moscow Victory Day Parade. Russian President Vladimir Putin commented on the absence of the leaders of several Western countries, including the former members of the anti-Hitler coalition, in Moscow on the Victory in Europe Day. It is heartwarming that despite all the politics behind the attempts to disregard the glory and contribution of fallen Soviet soldiers who died fighting against Nazi Germany, there are people in the West who acknowledge the real history and salute Russian men and women for their heroism during World War II. A nearly 30-salvo multicolor artillery salute was performed as part of the Victory Day celebrations in Moscow. The firework show continued for 10 minutes. Chinese and Russian marines took part in a series of sports competitions at the Russian naval base in the city of Novorossiysk playing futsal, tug-of-war and ping pong, Russian Navy spokesman said. Soldiers of the People's Liberation Army (PLA) practiced for some 10 hours daily in preparation for the military parade held on the Victory Day in Moscow's Red Square to honor the memory of those who fought in the war against fascism. Spokeswoman for the Russian Interior Ministry Elena Alekseeva stated that about 20 million people across Russia took part in celebrations commemorating the 70th anniversary of victory over the Nazi Germany in World War II on Saturday. 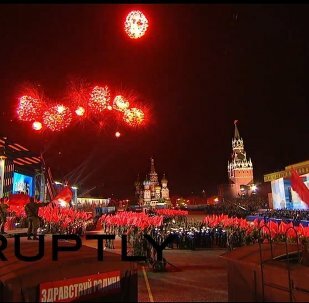 Celebrations of 70th anniversary of victory over the Nazi Germany in World War II in Moscow are culminated with a spectacular fireworks show. 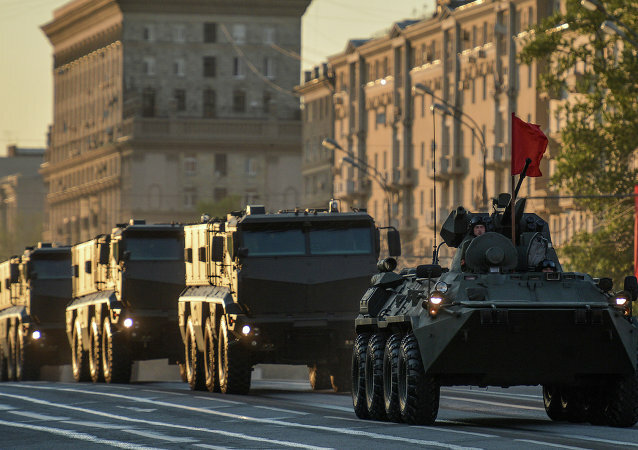 A total of 194 armored vehicles, along with numerous military helicopters and aircraft, took part in the military parade in Moscow, dedicated to the 70th anniversary of Victory in the 1941-1945 Great Patriotic War. Czech President Milos Zeman said that he believed the recent chill in Russia's ties with Europe would soon give way to "normal" political, economic and cultural relations. Here's a collection of photos from the Victory Day parade held today and the one that was held right after the defeat of Nazi Germany, in June 1945. Russian President Vladimir Putin thanked visiting UN General-Secretary Ban Ki-moon for helping uphold peace. 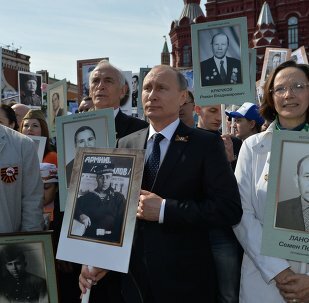 President Vladimir Putin said on Saturday that the "Immortal Regiment" march through Red Square testified to the strength and confidence of the Russian people. Russian President Vladimir Putin took part in a ceremony to lay flowers at the Tomb of the Unknown Soldier in central Moscow; he was accompanied by an array of high-ranking foreign politicians who along with Putin attended the Victory Day parade on Moscow's Red Square. In the course of the war, the Soviet Union lost more than 26 million people in the fight against Nazi Germany. Sir Tony Brenton, former British ambassador to Russia, said that he hoped relations between Russia and Britain, as well as other Western states, improve "fast enough to attend future such anniversaries" such as the 70th anniversary of Victory in World War II.